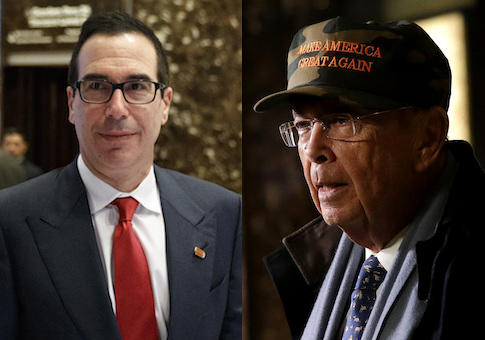 President-elect Donald Trump has chosen Wall Street executive Steven Mnuchin for his Treasury secretary and billionaire investor Wilbur Ross for his Commerce secretary. Mnuchin co-founded the private investment firm Dune Capital Management LP in 2004 and serves as its president and CEO. He also served as Trump's national finance chairman during the presidential campaign and previously worked at Goldman Sachs for 17 years. He is estimated to have a net worth of $40 million. "Steve Mnuchin is a world-class financier, banker, and businessman, and has played a key role in developing our plan to build a dynamic, booming economy that will create millions of jobs," Trump said Wednesday. "His expertise and pro-growth ideas make him the ideal candidate to serve as secretary of the treasury," he said. "He purchased IndyMac Bank for $1.6 billion and ran it very professionally, selling it for $3.4 billion plus a return of capital. That's the kind of people I want in my administration representing our country." Mnuchin said his focus will be on stimulating economic growth, cutting taxes, and creating jobs. "Our most important priority is sustained economic growth, and I think we can absolutely get to sustained 3 to 4 percent GDP, and that is absolutely critical for the country," Mnuchin said. "By cutting corporate taxes, we're going to create huge economic growth and we'll have huge personal income." The Washington Free Beacon previously reported that Mnuchin has donated to Hillary Clinton and Barack Obama's campaigns from 2000 to 2007, as well as to Republicans including Mitt Romney. President-elect Trump has also chosen investor Wilbur Ross for the commerce secretary post. Ross is chairman and chief strategist of WL Ross & Co., a private equity firm that is known for investing in financially distressed companies and making them profitable again. "Wilbur knows that cutting taxes for working families, reducing burdensome government regulations, and unleashing America's energy resources will strengthen our economy at a time when our country needs to see significant growth," Trump said. This entry was posted in Politics and tagged Department of Commerce, Donald Trump, Treasury Department, Trump Administration. Bookmark the permalink.